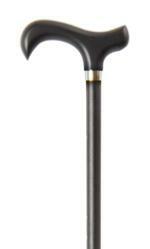 A smart, functional cane for everyday balance and support. The natural wood derby handle is painted black to match the anodised aluminium shaft. The cane is fitted with a neat metal collar and a non-slip rubber ferrule. Ferrule diameter 16mm.